Note: This is the bound book only and does not include access to the Enhanced Pearson eText. To order the Enhanced Pearson eText packaged with a bound book, use ISBN 0134290070. In this comprehensive, applied text, readers see why the study of infants and toddlers is important, why a relationship-based model is important for infant-toddler professionals to use, and what infant and toddler development looks like from pre-birth through age 36 months. 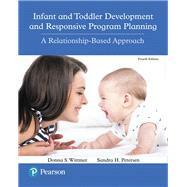 Included is information on the theories of infant-toddler development, the role of families and how to engage them in learning and development, and program planning using a relationship-based model. A major focus of the book is on the importance of families’ and teachers’ relationships and responsiveness in interactions with children. Research-based and yet highly accessible and motivating, the book offers a view of infants and toddlers that respects their capacities and brings compassion to their vulnerabilities, while providing a perspective and voice for teachers, family child care providers, and home visitors to bring to positive and powerful interactions with infants, toddlers, and their families. The Enhanced Pearson eText features embedded videos, check your understanding quizzes, and observation invitations. Donna Wittmer has a PhD in Child, Family, and Community Studies from Syracuse University. She taught Behavioral Pediatrics at SUNY in Syracuse and developed a family ­centered Early Intervention program on the Onondaga Indian Nation. Beginning in 1990 she taught ECE/ECSE at the University of Colorado Denver for 17 years. She is the author of numerous articles and chapters for early childhood education journals and newsletters. She has given many presentations for NAEYC and ZERO to THREE. She is the coauthor of Infant and Toddler Development and Responsive Program Planning, 4th Edition, Endless Opportunities, and The Young Child. She is also the author of a ZERO to THREE book on infant/toddler peer interactions and relationships. For ten years she served on the leadership team of the Expanding Quality in Infant/Toddler Care in the state of Colorado. This group wrote and delivered training of trainer materials for infant/toddler specialists who then delivered the curriculum to over 1000 infant/toddler caregivers in Colorado. Sandra Petersen has a rich background in many facets of the early childhood field. Beginning with teaching preschool, then directing an on­site hospital child care center, providing early intervention services, providing infant­parent psychotherapy, directing Colorado’s early childhood professional development system, teaching numerous college courses, and working for ZERO TO THREE in the Early Head Start National Resource Center and the National Infant Toddler Child Care Initiative. Ms. Petersen was a Zero to Three Fellow. She is co­author of three college textbooks on infancy and early childhood published by Pearson; The Young Child: Prenatal through Age Eight, Endless Opportunities for Infant Toddler Curriculum: A Relationship-­Based Approach, and Infant and Toddler Development and Responsive Program Planning: A Relationship­-Based Approach. She is the author of Caring for Infants and Toddlers in Groups by ZERO TO THREE. She created and has taught the Special Needs session for the Program for Infant Toddler Care for over 20 years. She has a Master’s degree in Educational Psychology and completed doctoral coursework in Early Childhood Special Education at the University of California-Berkeley.